“Bring what you have decided you are to every situation you find yourselves in. Bring your best version of yourself. Allow yourself to question who you are and who you want to be. It is easy enough for you to show up and be who everyone else wants you to be or expects you to be. That is playing the old game. That is putting yourselves on autopilot and just playing out the same old stories. But as you take a moment to consider who it is you really are and who it is that you want to be, then you begin living your lives deliberately. You take command and you show the side of yourselves that you want to be but find, at times, that familiar tug of who you have been. 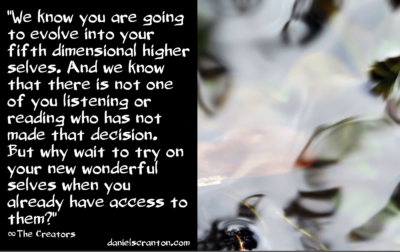 We know you are going to evolve into your fifth dimensional higher selves. And we know that there is not one of you listening or reading who has not made that decision. But why wait to try on your new wonderful selves when you already have access to them?